This year, for a very short time, an ex-soldier from Waterlooville was selling more books than JK Rowling. 'It was my dad,' John Bream, the former paratrooper, says. John’s book, A Fish Out Of Water, began as a form of therapy. 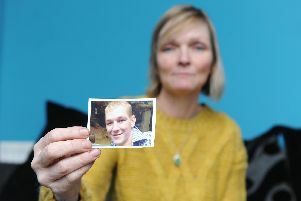 In December 2017, John saw on social media that a friend from 3 Para – ‘one of the muckers,’ as John refers to them – had been killed in Syria while supporting troops from the SAS. ‘I was quite upset,' he says. ‘My father said “write everything down, it will be therapeutic”. And John, a 32-year-old father of three, has a lot to write about. He served in the Parachute Regiment from the age of 17 for five years, seeing action in Northern Ireland, Iraq, and Afghanistan. In 2004, John became the Army Individual Championship’s featherweight champion. John has been attacked by rioters in Belfast, searched for IEDs (Improvised Explosive Device) in Basra shortly after the Iraq invasion, and was knocked sideways by an RPG (rocket-propelled grenade) in Helmand province. But it is his experience as a civvy, out of uniform and without orders, that has affected him as much as his soldiering. 'When I decided to leave the army, I went and saw the resettlement officer, this old major. ‘I could tell he wasn’t happy I was leaving. I got four weeks termination and was told to be grateful. “You wouldn’t get that at Tesco,” he said. This attitude has stuck with John: ‘I’ve had friends who have died. Lost limbs. Made the ultimate sacrifice. And there’s nothing for a lot of the lads once they’re out of the army. ‘When I came out, there weren’t a lot of Help For Heroes’ projects or veterans’ schemes. In more than one respect, John is lucky to be alive. In 2012, more British soldiers died from suicide than were killed by the Taliban. ‘In the army,’ John says, ‘you are surrounded by people working for the same goal. You’re one of the good guys, fighting the good fight. ‘There is constant teamwork. It’s so easy to be isolated when you leave. ‘I have a friend who was present when a another soldier earned the Victoria Cross – incredibly dangerous, incredible bravery. John had his share of bad luck. 'I did some terrible jobs after the army,' he says. But he managed to find some fulfilment working as a tree surgeon and as a safety instructor with Bear Grylls’ production company. It was after an army boxing buddy, Kirk McLaughlin, took his own life in November 2017, that John realised he had to do something for veterans. Less than a month after Kirk’s funeral last December, John and several ex-para and ex-marine friends started Project RV. The non-profit organisation runs monthly trips to the Brecon Beacons National Park, providing former paras and marines with the team building and adrenaline that John believes they need, with activities including abseiling, horse riding, and canoeing. ‘We didn't want to call it a support group. It’s a project. It’s not about having a problem. ‘It’s a chance for the lads to be lads together, get the fear factor back. ‘One guy come along who I was in the boxing team with, we were in Ireland together. ‘I wish when I came out of the army there was someone with similar experiences, someone like me, on hand to tell me everything will be all right,’ John says.